The U.S.S. Enterprise comes to the planet Ardana to acquire zienite, a rare mineral needed to stop a planet-wide plague on Merak II. 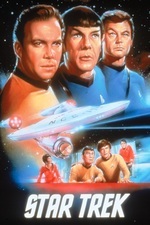 While investigating the planet, Kirk and Spock are caught in a civil war between the mining class Troglytes and the intellectuals and artists of Ardana that live in a Utopian city in the sky. "The Cloud Minders" was first broadcast on February 28, 1969. It is episode #76, production #74, written by Margaret Armen, based on a story by David Gerrold and Oliver Crawford, and directed by Jud Taylor. David Gerrold was reportedly unhappy with the way they modified the original story this episode is based on. It was supposed to be a play on MLK vs. Malcolm X. This episode also features Spock behaving in a very out of character way. Yeah, for pon farr to be a subject of casual conversation is so completely at odds with how it was introduced in Amok Time - the Spock of this episode seems to be a drop-in from some parallel universe Trek. And the Troglytes vs Ardana story is a mess as well. The Ardana dresses must have been fun for cosplay though. I do have one fond memory of this episode. We were playing one of the first Star Trek tabletop RPG's in the 1980's, and the player who had a science officer character said that he wanted to scan a meeting room with his tricorder. I vetoed that, saying scanning would be rude, like bringing in a food taster before a lunch, but then we watched Cloud Minders and saw Spock casually wander around scanning everything during the first meeting. Rats, I thought, I was wrong. But now I know I was right, because that wasn't the real Spock. Vindication!